Anti-vandalism paint (also known as non-drying paint, anti-climbing paint, anti-intruder paint and anti-vandal grease) is a specific type of security paint, used to deter people from attempting to illegally gain access into buildings by scaling walls. What makes it a deterrent to would-be intruders? Anti-theft paint essentially remains forever slippery, long after application. The thick, oily coating should be applied with a trowel, a stiff brush or with your hands (obviously while using protective gloves) and gives a smooth, gloss-like finish. As it remains sticky and slippery to the touch, anti-climb paint prevents people from gaining a foothold on the surface, and therefore deters them from getting into the building or area. These non-drying, grease-like coatings can be used as anti-climb protection on anything from lamp posts, parapets, boundary fences and roofs to walls and fences. 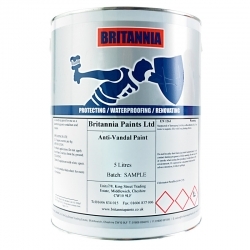 As an added advantage, these anti-burglar paints leave marks on anything – and anyone – that comes into contact with them, so it can help to identify intruders after the attempt. Anti-climb coatings and paints continue to work in all sorts of weather conditions, and excessive heat or cold don’t impede their efficacy. Remaining effective for around three years, most types of anti-vandal paint will then need to be assessed and possibly re-applied, depending on the local environment. To keep the general public safe, burglar paint is generally applied only above a certain height – 2.4m above ground in most circumstances. This is to protect people but also because it’s particularly effective when an intruder climbs a certain distance and is then stopped in their tracks by a band of anti-burglar paint. At Rawlins Paints, we have a variety of vandal proof paint and anti-climb security coating products in stock. We also stock signs and posters that should be used alongside the anti-theft coating as an added deterrent to would-be intruders. These anti-climb security paint products are referred to as ‘anti-climb grease’ by some people, but are, in fact, specifically formulated oil-based paints. Blackfriar Professional Anti Climb Paint is available in three colours: black, tile red and tile green and is a thick, non-drying coating that can be applied to concrete, plastic, metal or wood surfaces. As with most security paints, it makes surfaces pretty much impossible to climb while marking the clothes and hands of anyone who comes into contact with it. Coo-Var also offers its own non-drying anti climb paint with Vandalene. 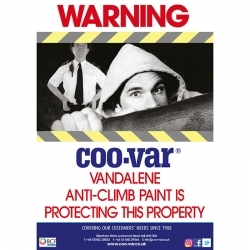 Ideal for protecting your property, business, gardens or any other area from the threat of intruders, Coo-Var Vandalene is an anti-burglar paint for fences, window sills, walls and much more. Leaving a sticky coating that is permanently non-drying, Vandalene can be used anywhere you think could be used as an access point into a building or area under protection. With a semi-matt finish, it’s available in red, grey, green and black and can be used to guard against theft. Coo-Var also has a hidden identifier within the make-up of the paint that can later help police identify intruders. We stock one variety of anti-climb security paint that can be applied as a spray paint. 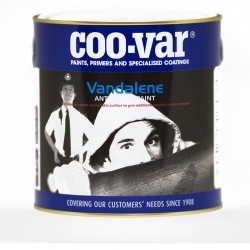 Coo-Var Vandalene can be bought as an aerosol anti-burglar spray paint, but only in black. It displays the same properties as the paint described above, and also contains the identifier that could help identify anyone who has been in contact with your building surface. Also by Coo-Var, we stock Vandalene Deterrent Signs that should be used alongside the non-drying paint as an added warning. These no climb products will help greatly in protecting your building, whether it’s a commercial holding, factory, fence, post, gate or your residential property. The signs clearly show that Vandalene is being used at the premises and that anyone who does attempt to gain access illegally is likely to have their clothing marked and stained with an identifying ink that can be traced by the police for weeks after their break-in attempt. For more information on anti-theft paints and coatings or to find out which product is ideal for your needs, don’t hesitate to get in touch with our Technical Team.